The road starts and ends on Rt. 120. You can start at either end. For example, you can start in the town of Emporium, PA and head south out of town on Rt 3001 and follow it all the way as it zigs and zags and ends up running back into Rt 120. There are a couple look out points that overlook Emporium that have an excellent view. Elevation change goes from around 1100 Ft. up to 2000 Ft. 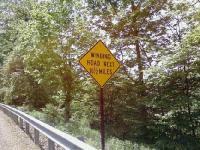 The sign says it best - "Winding Road Next 10.5 Miles." There is a lot of fun to be had on this road with lots of 90 degree tight turns. Overall the surface is in good shape with minimal potholes and bumps. The only amenities are at the start of it in Emporium where you can find gas and places to grab a bite to eat. on July 10, 2013 2 out of 2 members found this review useful. This was a great road to drop off of 120. There was a lot of turns and twists and I would recommend it to any going in along 120.
on May 27, 2018 1 out of 1 members found this review useful. Lumpy is the active word here. On paper and if not for the lumps this looks like some sweet thing out of TN or NC, but with the lumps the road's experience is severely diminished. Check it out if you're in the area, but don't bother coming from any great distance for it. on July 17, 2016 0 out of 0 members found this review useful. As of the date of this review, route 3001 was recently tar and chipped making it very difficult to take corners with any confidence, or ride in general. That said, the route does look promising once the road gets worked in and settled.